The Rebel Sweetheart. : Join | Iris and the Dragonflies Giveaway! 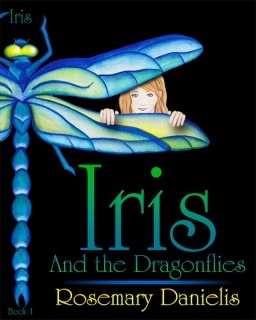 Iris and the Dragonflies is a novel written by Rosemary Danielis. The book is all about an eleven year old child named Iris. Unlike all other children, she prefers staying on the creek instead of playing with her friends. She also do not like going to school, not because of her resistance for learning but because of the fact the she can't relate with her classmates. Her only friends are the dragonflies. It amazes her how she can connect and relate with the said creatures. Nonetheless, Iris is a special and loving child. She cares for the environment and enjoys doing great things for everyone. Her deep connection with the dragonflies became stronger especially when she learned about her destiny. Iris: "A journey? Where am I going?" Lea (dragonfly): "It's a journey into the future. Don't worry Iris, you are not alone. We are all in this journey together." The relationship of Iris with the dragonflies is exceptional. It was only with these creatures that she learned the true meaning of friendship. This novel is a certified must-read! It's perfect for all ages. You can read it yourself and allow Iris to bring you back to your childhood days. You can also give this book to your kids and teach them about how Iris managed to fulfill her destiny. If you wish to read Iris and the Dragonflies, enter on the Rafflecopter below! Six lucky winners will receive copies of the book - 5 Kindle versions and 1 Paperback copy (autographed)! Wait, there's more. One winner will be randomly chosen to win $25 gift card to spend on Amazon. The giveaway will run from April 7 to 21, 2012. This review and giveaway is written and prepared by I Heart Giveaways.